Hanover, VA – On Sunday, February 28 2016, at approximately 2:55 a.m., the Sheriff’s Office responded to 7-11 located in the 6600 block of Cold Harbor Road for a report of a robbery. The suspect entered the business, produced a firearm and took an undisclosed amount of cash. The suspect was last seen leaving the area in a gray minivan. Just prior to the incident in Hanover County, at approximately 1:59 a.m., the suspect entered a 7-11 in Henrico County located on Nine Mile Road at Airport Drive and committed a larceny. 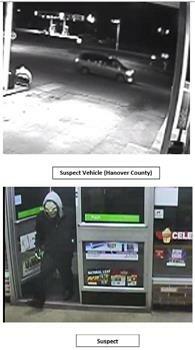 The picture below is the suspect entering the 7-11 in Henrico County. The suspect is described as a black male, wearing a mask, dark colored jacket, dark colored pants and black and white gloves.